Alright, let me start by saying I know Brussels sprouts can be a very polarizing vegetable. Truth be told, I wasn’t always a fan. If that’s you, too, I get it! I also think it really comes down to whether or not they’ve been cooked properly. Technique here makes all the difference… crispiness is the key! Getting the outside nice and crispy will not only create a more pleasant and addictive mouthfeel, but will also caramelize the natural sugars and deepen their flavor. In other words: DELICIOUS. 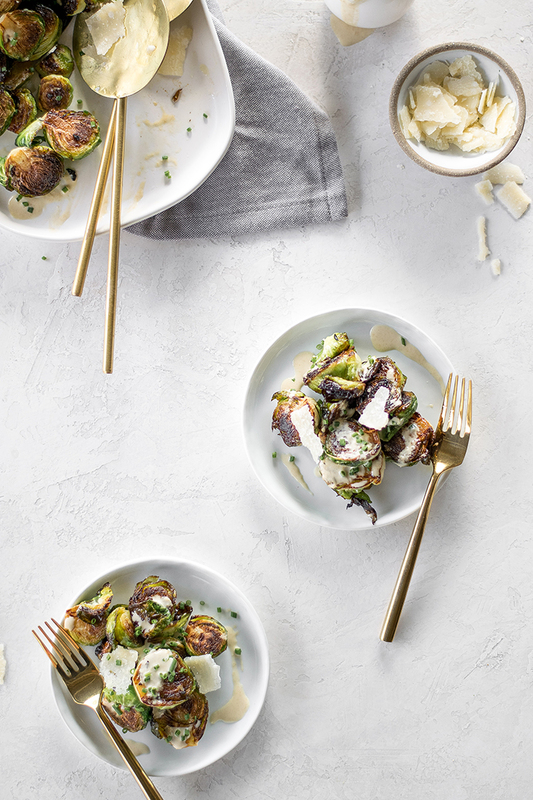 Trust me when I say once you taste these Crispy Brussels Sprouts with Caesar Dressing, you’ll be craving those little green morsels all season long! This dish is inspired by an insanely delicious, crispy Brussels sprout caesar salad I had at a food truck here in Seattle, Bread and Circuses. 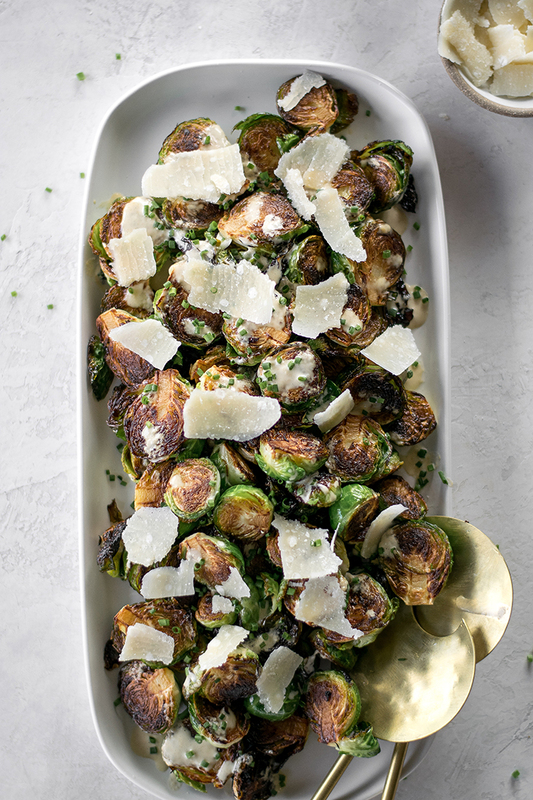 Super crispy Brussels sprouts are tossed in a rich caesar dressing, a shower of grated parmesan, and plenty of croutons. I’m fairly certain they deep-fry their Brussels sprouts to obtain optimum crispiness, but I like you too much to make you deep-fry something, especially if you’re making these on Thanksgiving! Nooo one needs that stress, especially when preparing a side dish for Thanksgiving. So a quick flash-fry to get the exteriors crispy before they finish in the oven will be perfect. Once they get nice and crispy, we’re going to drizzle them with a deliciously creamy and lemony (not to mention easy) caesar dressing, add some parmesan shavings for good measure, and a sprinkling of chives for some freshness. 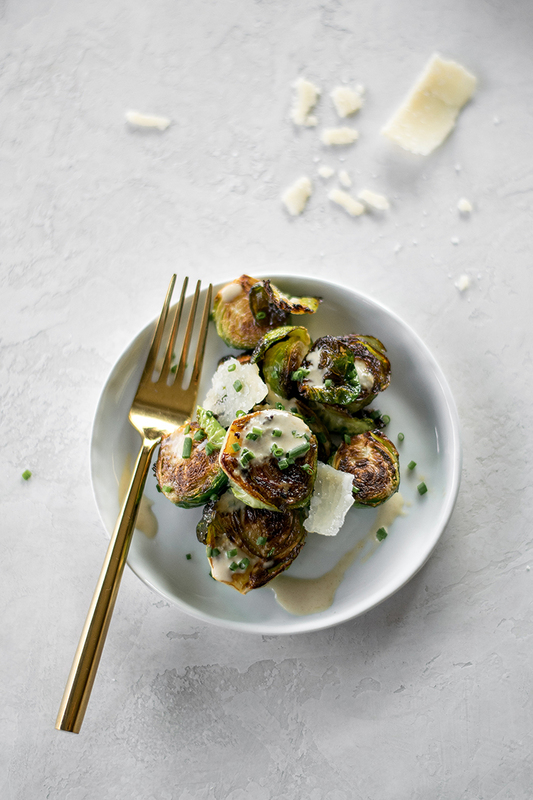 These crispy Brussels sprouts are seriously an umami bomb and are the perfect side dish or appetizer for Thanksgiving. You may even find yourself making them after the holiday is over. I know I will. Enjoy and Happy Thanksgiving, friends! Preheat oven to 450 F. Heat a large cast-iron skillet over medium-high heat and add enough avocado oil to coat the bottom of the pan. We don’t want to over-crowd the pan here or they’ll steam rather than fry and crisp up so once the oil is shimmering and hot, work in batches to add in the Brussels sprouts cut-side down and allow them to fry until golden, about 2 minutes then flip and crisp on the second side. Transfer Brussels sprouts to a rimmed baking sheet and sprinkle with salt. Roast for about 15 minutes, until sprouts are tender when inserted with a paring knife. While the sprouts are roasting, make the dressing by whisking all the ingredients together in a large bowl and setting aside. To make the parmigiano reggiano shavings, use a vegetable peeler and shave pieces off the side of a block of parmigiano reggiano. Set aside. 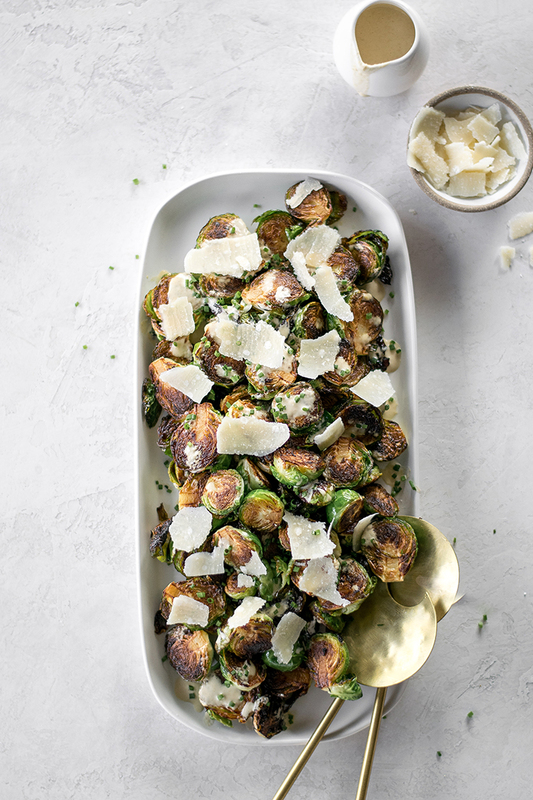 When sprouts are done, transfer them to a serving platter and drizzle generously with the caesar dressing. Finish by sprinkling over the chives and parmigiano reggiano shavings. Serve immediately. Photography, styling, and recipe by Taylor Harbin of All Purpose Flour Child for Jojotastic.